Eocarcharia dinops the dawn shark was a basal charcharodontosaurid that lived in the early cretaceous in Africa. It grew up to 8metres in lengh and weigh about 1to 3 tons. WoW that's so realistic ! I always use 3 types of pencils:A 0,5 milimeter retractabe pencil, a 0,7millimeter retractable pencil and usually a 12 millimeter graphite pencil for the shadows. The 12 millimeter one wasnt used here because i lost him some time ago and during the next few months of 2010 and the beginning of 2011 I had to use a 5 millimeter black graphite pencil . Eocarcharia for example was drawn with it. Since a few weeks I have got a 5 millimeter 6b grey graphite pencil . I use this new pencil now. But hopefull I can get a 12 millimeter one soon. I hope 4 you that you get your 12 millimeter back soon ! Wow! 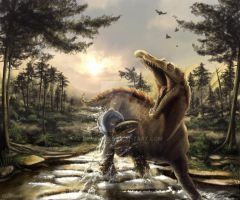 That's seriously one of the most beautiful PaleoArt i'v ever seen!